It’s odd that there is a pressure in me to produce a completely new and unique work each day. While I intend each work that will be unique that doesn’t mean that I have to summon up a totally new idea each day. I have only just realised that I could work on developing a single idea over a period of time – I had already thought of doing special series, say at Christmas – and I had sort of forgotten that part of this process is the final installation, so perhaps I will do series of similar work for stretches at a time. It will perhaps be like the wave-carved ripples on the wide sand beaches, the same but totally different every day. And some days there will be a rock or a crab. But mostly it will just be the same but totally different. There again I may not do that! I thought it would be sunny today but it turned out dull and drizzly. 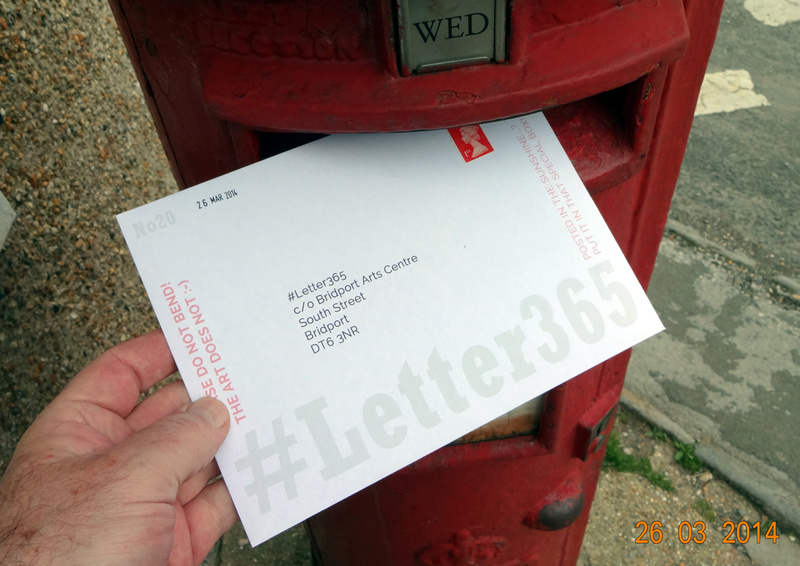 So today’s #Letter365 offering got everso vaguely damp in the 30 paces to the post box. 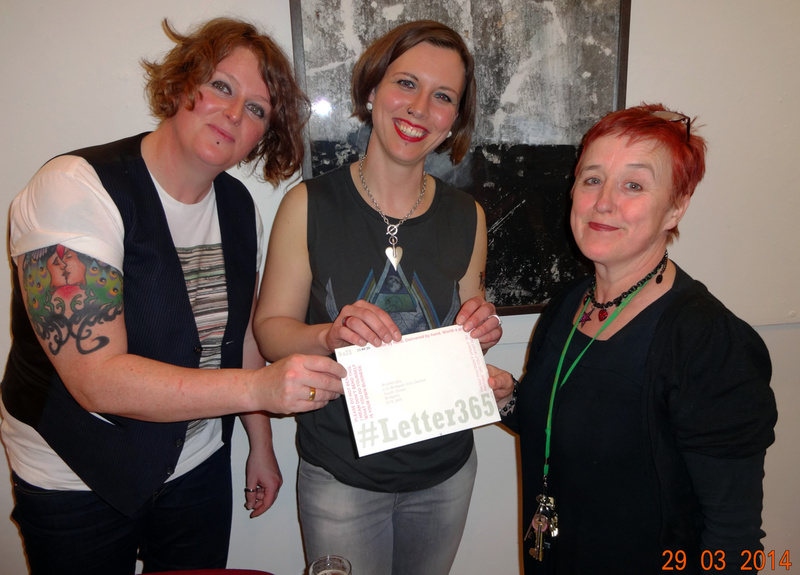 After a blistering performance at Bridport Arts Centre acclaimed folk duo O’Hooley & Tidow did me the honour of handing over today’s #Letter365 to Jill Beed. It’s the third time we have seen Belinda and Heidi and they never fail to delight. Tonight their cascading harmonies were tighter and sweeter than ever. 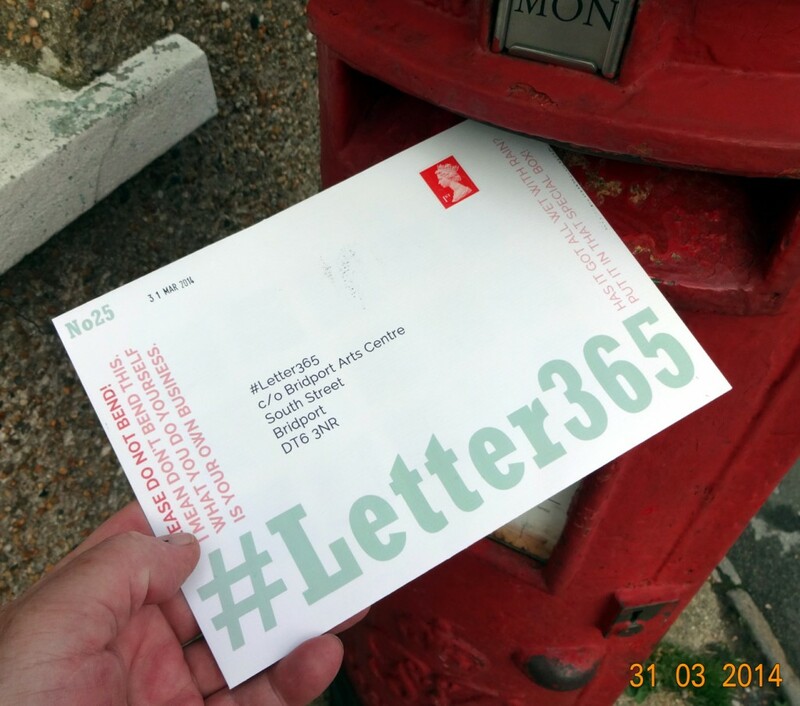 I just hope whoever buys No23 will be delighted as me. 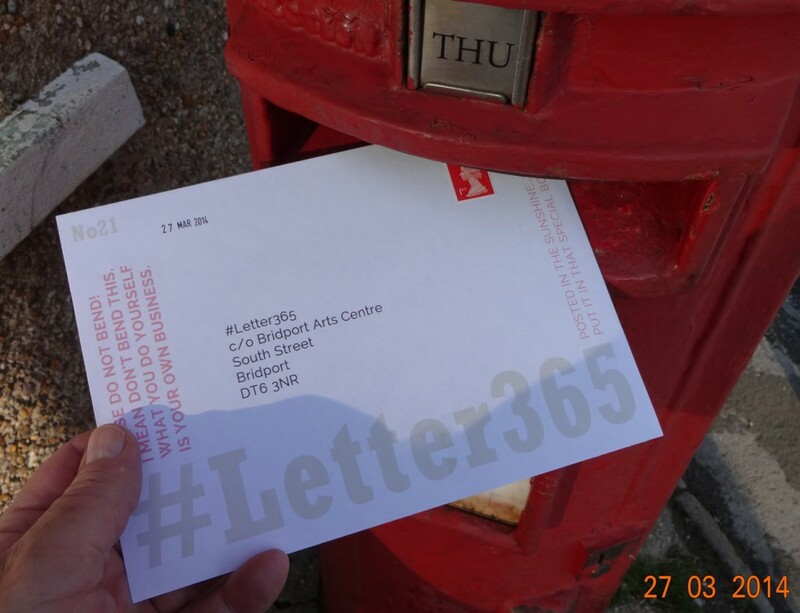 Jill and Dee at Bridport Arts Centre are still pleased to see me and seem delighted to receive another #Letter365 offering. We’ll see how they feel in 6 months time! 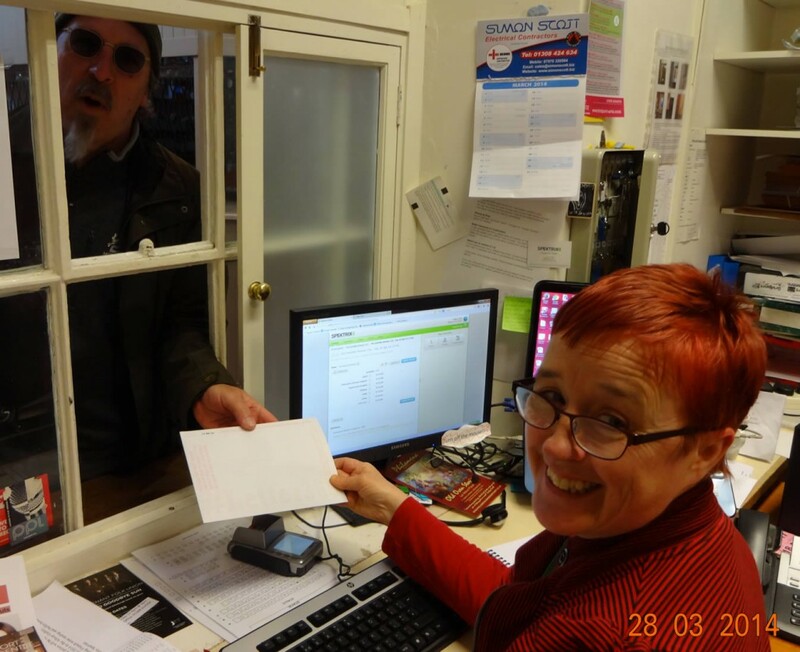 It’s interesting that Dee, who took this picture, suggested the picture should be taken from inside the office and that Jill should turn and smile into the camera (and an excellent smile it is too as always Jill). Yet when I took a photo of Dee taking delivery a few days back the most she would allow to seen on camera was her thumb! I saw this to be useful wisdom for those nights when the brain is overactive: excited by all the brilliant ideas for brilliant things that you will create or do or think next day. Telling yourself that they are all crap and if there are really any good ones you will remember them in the morning, can help you get back to sleep, the sleep you need to have a creative day next day. Last night after just 40 minutes sleep I was disturbed by the cats, or my parter, or a putative burglar or a good/bad idea and found myself awake for the next two hours wondering if I should risk the disturbance of recording the creative maelström in Evernote or getting up and making a calming tea whilst jotting it all down in my notebook. 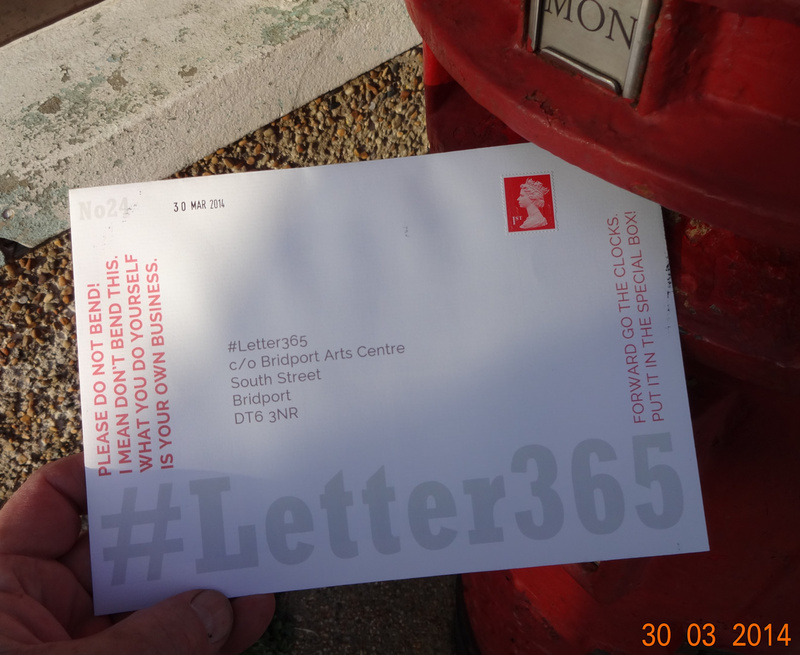 I did write a couple of words in the dark on a small scrap of paper – one of which was a useful memory jog, the other was a superfluous reminder of something I really would not have forgotten anyway! I did manage to tell myself that “all these ideas are crap anyway” but ignored my advice and stayed awake desperately trying to imprint my brilliant ideas so firmly in my mind that I would be able to instantly access and use them this morning. Well, what a success! I woke to find I had clearly remembered 3 or 4 of the dozens of good/bad ideas I had had in the night. These must be the worthwhile ones! So I was quite excited to get to the studio quite early and start working with them. Well I fiddled with this idea for about 30 seconds more before I realised that it really was crap. I reviewed the other ideas that I had packaged up from the night and concluded they were not much better. The good thing was that this left me totally clear to approach my #Letter365 piece open and fresh. 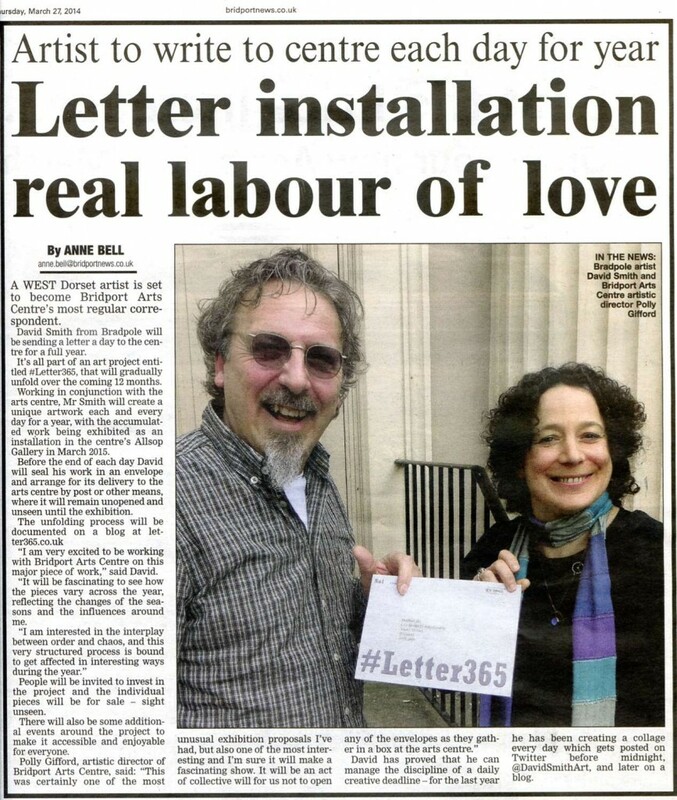 Immediately I had discarded the rubbish I knew exactly what I wanted to do and as I worked it developed a purity and clarity that almost brought tears to my eyes.